C# is a language of breadth. At one end it allows low-level programming with pointers and lock-free synchronization; at the other end, it sports high-level features such as closures, expressions trees and asynchronous functions. Which leads us to a challenge: can we write a non-contrived program that uses all of the above? The answer is "of course! ", and I'm going to walk you through a practical example: a high-speed communications library built on shared memory (and used in production!) Come and join the author of C# 7 in a Nutshell and LINQPad in an advanced session, where we step outside the box and play with all of C#'s best toys at once. September 2017. While startups can be great for venture capitalists, they're usually a poor deal for the participants. After working crazy hours for months or years, you face depressingly low odds of success. But there's another way: By finding a niche and deliberately staying small, you can dramatically up the chance of success - while balancing income, hours and lifestyle. Without having to answer to investors or an employer. The rules for a software lifestyle business are very different to the rules for a start-up. In this session, I'll share what I've learned over the past 10 years, writing and selling a successful programming utility. We'll cover both technical and business topics, including idea incubation, marketing, competitive analysis and monetization, as well as practical tips on payment processing, dealing with large corporations and resellers, providing support, and maximizing productivity and happiness while sole-programming. 16 August 2017. C# is a language of breadth. At one end it allows low-level programming with pointers and lock-free synchronization; at the other end, it sports high-level features such as closures, expressions trees and asynchronous functions. Which leads us to a challenge: can we write a non-contrived program that uses all of the above? The answer is "of course! ", and I'm going to walk you through a practical example: a high-speed communications library built on shared memory (and used in production!) 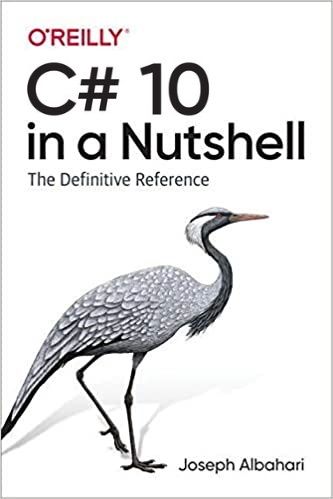 Come and join the author of C# 7 in a Nutshell and LINQPad in an advanced session, where we step outside the box and play with all of C#'s best toys at once. 17 August 2017. What's the fastest way to talk to another process? Without pipes or any networking protocol? Tonight, we're going to build a communications library entirely on shared memory. We'll first discuss the practical motivation, as well as the broader principle of when it's appropriate to roll your own library, and the single most important trick in making such projects viable. We'll then start coding, and show some practical uses for stuff you might not use every day - including expression trees, pointers, and lock-free synchronization. November 2016. Just as writing functions doesn't turn you into a functional programmer, writing async methods in C# doesn't turn you into an asynchronous programmer. To get the full benefit of asynchrony, we must go further and treat futures in the same way that functional programmers treat functions (and object-oriented programmers treat classes). In this session, we'll go beyond the standard pattern for writing async functions in C#, and demonstrate how to simplify asynchrony and concurrency by thinking of futures as fundamental values. August 2016. As computers continue to become faster, and programming languages more powerful and abstract, the question arises: is there still a need for the humble pointer? I will demonstrate why the answer is 'yes', and show some practical scenarios in C# where some basic pointer skills pave the way for simpler and more efficient applications on today's desktops and devices. August 2015. This session will demonstrate how to use the new features of C# 6 to simplify your code and reduce clutter. We’ll talk about what makes the new “Elvis” operator special, and also demonstrate the power of “Roslyn”, the new compiler-as-a-service. May 2015. If there's one thing harder than writing a debugger, it's debugging it. Join me for a 45-minute demo on what I learned in writing the integrated debugger for LINQPad, and the lessons in debugging in general. February 2015. Join me for an hour of productivity tips on concurrent and asynchronous programming. We'll cover everything from simple tricks to the monadically marvellous, and upload extension methods and classes you can take away and use immediately. We'll also describe a general strategy for dealing with difficult concurrency problems, and discuss which low-level constructs are still relevant, and when to use them. 6 November 2014. We take for granted that the goto statement is bad. Instead, we employ alternatives that make our code easier to understand and reason over, namely structured looping constructs such as while-loops and for-loops. But have you ever considered that functional programmers look down on our looping constructs (or more specifically, our impure use of variables) in the same way we look down on goto? And they've got a point. By avoiding some of our most time-honoured tricks, we can end up with code that's not only easier to understand and reason over, but that scales better. October 2013, Brisbane, Sydney, Melbourne. Join me in a genuine 400-level talk at TechEd 2013 for programmers and architects on how to program time with asynchronous functions and Reactive Extensions. 3-6 September, 2013, Gold Coast. You've heard, time and again, that multithreaded programming is impossibly difficult. I'm going to tell you that everything you've heard is wrong: concurrency itself is reasonably easy. The complexity arises from allowing concurrency logic to mix with application and business logic. And from confusing time-based concerns with concurrency-based concerns. Solving this properly requires a new way of thinking about time, concurrency and space. We need to treat time as a dimension in its own right and embrace the Four Laws of Time. Join us as we hop into the Tardis and take a time-centric look at C#, asynchronous functions and Reactive Extensions. 1 August 2013, Perth. Programming evolves through the creation of new abstractions, allowing us to more cleanly express intent while avoiding complexity, duplication and plumbing code. Yet most of the techniques and patterns in use today assume that the data we need is already there, spread out over space rather than time. With the rapid growth of interconnected systems, we can no longer afford to treat latency as an afterthought, creating warts in our otherwise clean designs. Instead, we need to flip our perspective and embrace time as a first-class concept. In this keynote, we'll make this perspective shift, leading naturally to an understanding of C#'s asynchronous functions, Reactive Extensions, and the art of programming over both space and time. 20 July, 2013, Melbourne. Explore C# 5's asynchronous functions and Reactive Extensions interactively in LINQPad. This is a chance for some hands-on concurrency programming, as well as an opportunity to discover more about using LINQPad as an exploration and development tool. 20 July, 2013, Melbourne. Ever struggled writing or debugging multithreaded code? 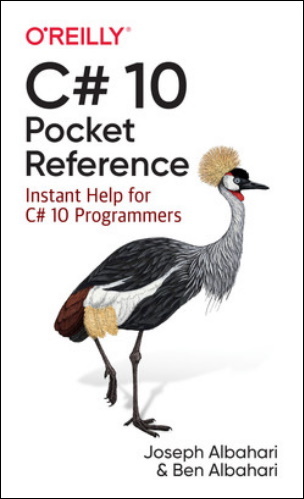 Join Joe Albahari, author of C# 5 in a Nutshell, in Singapore for a practical session on how to write responsive applications in C# 5 without resorting to threads, locks or BackgroundWorker. We'll explore the theory as well as the practice behind C# 5's new asynchronous functions, and see why the old-school approach is not only hard work, but fundamentally broken. We'll also touch on Reactive Framework, and they'll be a question-and-answer session on all aspects of C# 5, asynchrony and multithreading. 4th October 2012, Singapore. Join me in a Channel 9 Interview with Charles Torre on LINQPad and C# 5. December 2011, Melbourne. Had enough of your data centre or web hosting company? Join us at the Perth .NET user group, Thurs Nov 3rd 5:30pm, and find out how to move your MVC or Web Forms apps into the cloud and enjoy high availability, security and scalability - without the responsibility of OS installation, updates or security. This session will be full of practical advice and lessons learned from Joe’s own experience migrating two web sites and a licensing server into Azure, all of which now run inexpensively on a redundant pair of extra small instances. 3rd November, 2011, Perth. Discover the magic of asynchronous programming in C# 5 at TechEd. This is a deep-dive session and will cover both the theory and practice. September 2, 2011, Gold Coast, Australia. Find out about the exciting new technology that's coming to .NET parallel programming - click the link for a recording of this popular session. September 2, 2011, Gold Coast, Australia. Experience the magic of C#'s new await and async keywords and how easy asynchronous programming has become with Microsoft's latest CTP. There will be plenty of practical examples, deep dives and discussions on the general principles of asynchronous programming. June 2, 2011, Perth. Join me in an interactive webcast on the recent and upcoming features of LINQPad and its support for C# 4.0. March 23, 2010. In this talk, I'll cover all of C# 4.0's new features. We'll discuss best practices, show off dynamic Office and Python interop, and explore some novel uses for dynamic typing that may not have crossed your mind. In particular, we'll examine a surprising pattern whereby a little quacking can make large classes much more manageable. VB programmers may attend - but please, no smirking! November 5, 2009, Perth, Australia. This is your chance to see the session that I'm presenting at TechEd Australia (Gold Coast) in Auckland. September 14, 2009, Auckland, New Zealand. Ever thought of using your .NET skills to write a program to sell over the Internet? It's easier than you think! This presentation will cover both the technical and marketing aspects of what I've learned in setting up a successful Micro-ISV. June 4, 2009. Perth, Australia.